So I don’t normally do product reviews, in fact this may be my first. The reason for that is purely my limited knowledge of skincare and beauty that leaves me feeling ill equipped to ramble on about products. Since getting more interested in the beauty blogiverse I have become a little more aware of what I am putting on my face so when my friend had spares of these two products up for grabs I jumped at the chance to give them a go. 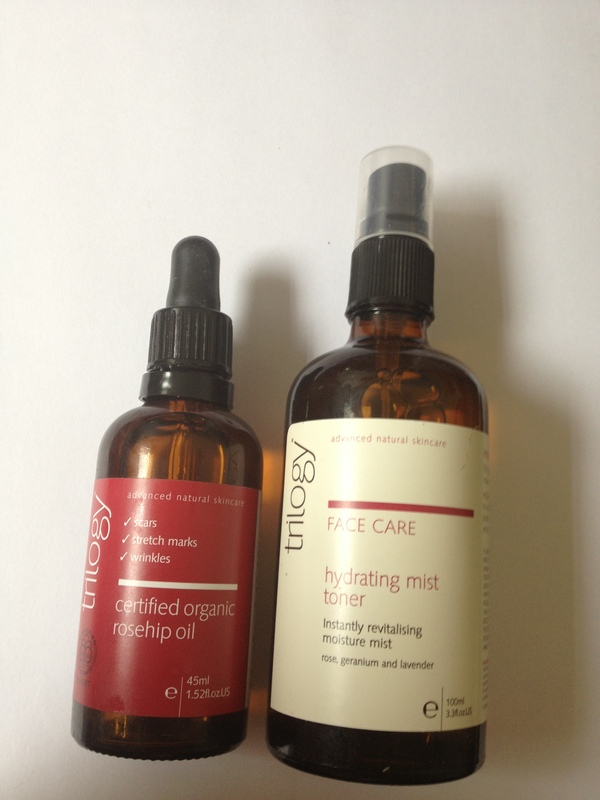 I had never tried Trilogy before but had heard various good things about their skin care range. I avoided them purely because of price, my skin care all comes from the supermarket haha. I have incredibly dry skin so have been on the look out for oils like this to try. For my face I add two drops to my moisturizer at night (not during the day because it just gets too heavy for this heat) and for my hands which are my other big problem area in terms of eczema and dry skin I often put some drops into a hot water bath to soak my hands in for ten to twenty minutes. Also, while I was on our little Northland road trip I was extremely lazy with skin care routines and this was kind of my go-to moisturizer when I couldn’t be bothered digging through my bag for day and night creams. So how did I find it? I love this product. It has made the skin on my face softer by morning and it feels less dry all through the day. The redness on my face has also reduced although this could be due to either product. I haven’t had any reactions to the oil and it blends into my skin without leaving an oily residue on top like some others I have tried. I like the fact this is certified organic, always makes me feel better putting organic products on my sensitive skin. Also, during the time when I used only this on my face, day and night, my skin looked better than ever! Needless to say I am rather impressed. This product is what the name describes…a hyrdrating mist toner that you spray all over your face post cleanser and pre moisturizer. I am notoriously lazy when it comes to toner but since getting this have used it every day! I love how much easier it is to spray this and let dry before moisturizing (although if you prefer applying on a cotton pad that works too). I also spray this on when I am getting really hot and revolting. I haven’t had any negative reactions to the product and my skin is looking better than ever! The scent is Rose, lavender and geranium and its subtle yet fresh and floral which I love (the lavender isn’t too overpowering which can easily happen I find). All in all I love both these products and when I run out I will definitely repurchase to keep my skin happy but not my wallet/husband. The prices for these two products in NZ aren’t cheap but I can’t get the exact price off the Farmer’s website. I’ll update this when I find out but until then you can check out the cheapest prices for Trilogy products online at PriceMe. You can buy Trilogy products in New Zealand at Farmers as well as at a lot of Pharmacies and some selected health stores. I also like their Replenishing Night Cream. Natural and gives great results. Oh thanks, i’ll keep an eye out for it!